August will forever be “back to school” month for me, and it always reminds me of PB and J’s, and all of my favorite peanut butter goodies. I’m sharing one of my all time favorite recipes with you this month, from a woman who was kind enough to share her beloved heirloom recipe with me. This recipe is from a dear friend who is no longer with us. Gail Atkins was one of those people who loved to share her baked goodies with everyone around her, and I was one of the lucky ones who got to know her and enjoy her amazing baked goods. You won’t find easier or more delicious peanut brittle anywhere! Please enjoy! This recipe came to me with love, and I’m passing the same on to you! In a medium sized microwave-safe bowl, combine the syrup and sugar, stirring well until blended. Microwave on high for 3 minutes. Add the peanuts and microwave on high for another 3 minutes. Stir in the butter and vanilla, blending well. Microwave on high for 1 minute. Add the baking soda and stir until foamy. Pour onto a greased cookie sheet. Do not spread with a spatula! The brittle will not cover the entire sheet. Cool, and break it into pieces. 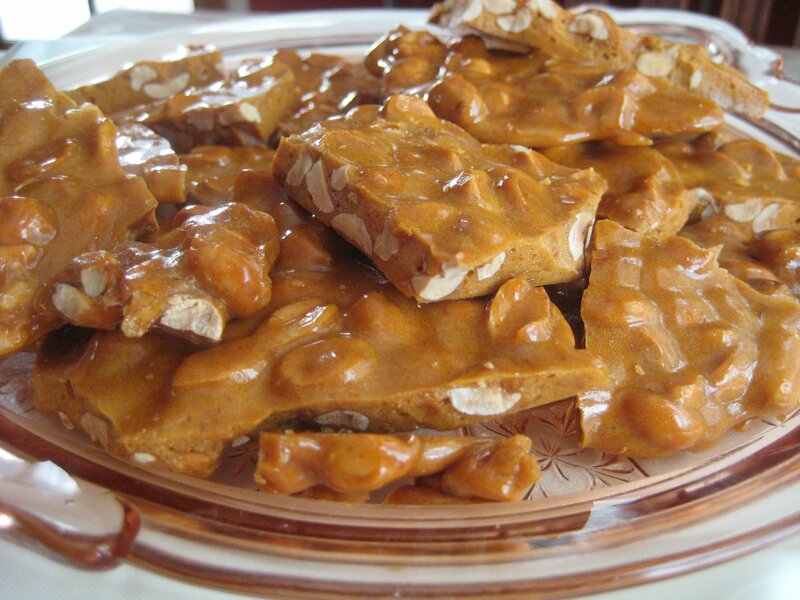 Peanut brittle can be put in a plastic container or frozen. Microwave must be at least 1,200 watts. Check inside your microwave for information. Use a fork or spatula that can withstand high heat. Have all ingredients on hand and measured out. When pouring the brittle onto the cookie sheet, work fast, as the brittle sets up quickly. Again, do not spread the peanut brittle with a spatula! Just let it pour out, that's what makes it light and airy! Immediately wash the bowl and spatula in hot, soapy water.